IJBES is an international peer-reviewed journal addressing the present researches, developments and best practices in the field of built environment which includes Urban and Regional Planning, Architecture, Quantity Surveying, Landscape Architecture, Construction and Building and Infrastructure Development in view of social, cultural, economic and environmental sustainability. Focusing on the global audience with an aim to engage their interest, IJBES publishes articles that cover various themes and current topics which attract the interests of researchers, practitioners, government agencies, the private sectors, non-governmental organisations and local communities. The International Journal of Built Environment and Sustainability (IJBES) is the substitute of Journal Alam Bina (JAB) - ISSN 1551-1369. The Journal Alam Bina was published in 2003, and continues up until 2008. Thus JAB can be considered as the embryo of IJBES. The e-ISSN of the IJBES is 2289-8948. To catch international authors, IJBES is promoted to be an international journal with international editorial board and maintains peer-review process. With expanded scope of the Journal, IJBES attempts to be the outlet of local and national authors in the built environment and sustainability field to publish their researches and projects while capturing international authors to share their knowledge. IJBES is published online with a frequency of three issues per year in January, May and September every year. Application to publish special issues is opened throughout the year. Interested applicant may submit application by sending us email at ijbes@utm.my. IJBES has recently revamped the article format. Prospective authors are advised to download the new format from the submission tab. To ensure correct indexing, authors are advised to provide complete metadata upon submission. 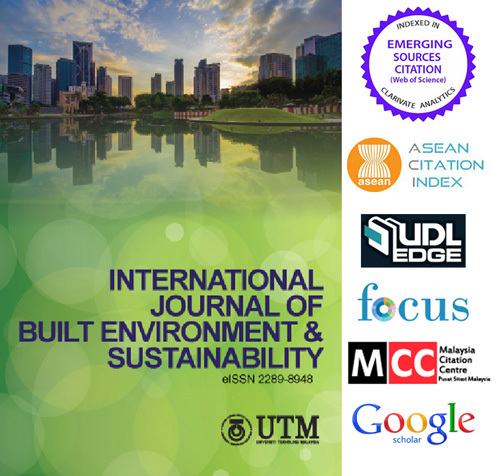 On behalf of the IGCESH 2018 secretariat, we would like to express our gratitude to the International Journal of Built Environment and Sustainability (IJBES) and Penerbit UTM Press for facilitating the publication of this special issue. We recognised the effort put forward by the editorial team and the scientific review committees involved, from selecting and forwarding the manuscripts all the way to the publication of this special issue. This helps to ensure selected manuscripts fit within the scope of IJBES and therefore comply with the strict publication requirements. The 7th IGCESH 2018 was successfully held on 13 to 15 August 2018 and had attracted more than 300 papers. This yearly event had managed to gather 115 papers under the theme of science and technology, and following a thorough review, 20 papers covering on the built environment, construction, geoinformation and surveying were selected to be in the special issue. The editorial board of the special issue is pleased to invite readers to peruse the items of interest, seeking to provide insights on the latest in construction management and technology, sustainability, real estate, tourism, urbanisation and rural planning, geographical information system and others. We believed that the discussion provided through this special issue is significant to support the Sustainable Development Goals (SDG) initiatives by the United Nation (UN) which is instrumental towards the 2030 Agenda for Sustainable Development.